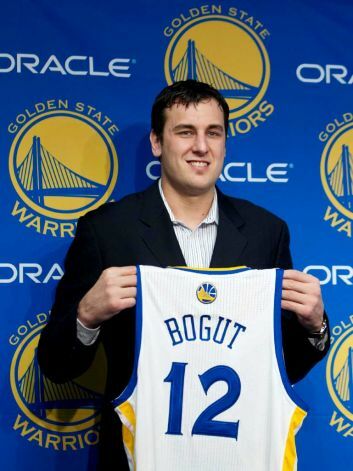 What Should Golden State Expect of Andrew Bogut in 2012-13? The Warriors have finally gotten the piece that they have been missing for a long time: a true big man. Seven-footer Andrew Bogut is a former number one overall pick and has been consistently at the top of the centers in the NBA—until he got injured last season. The Warriors needed to shake something up in their player personnel so the front office took advantage of the opportunity. In a multi-team deal that sent Monta Ellis to the Milwaukee Bucks, the Warriors got their wish in Andrew Bogut. While he is nothing close to the league’s premier centers in Andrew Bynum and Dwight Howard, Bogut is in that second-tier of solid, reliable centers (that is, of course, provided he is healthy). The three years prior to his injury-shortened 2011-12 season, Bogut averaged a double-double that included as many as 16 points per game. That is exactly what the Warriors hope they are getting with the 27-year-old from the University of Utah. The Warriors already have an excellent post presence in David Lee (who also has a solid mid-range game) and 10-15 points per game is all that they need from Bogut considering that they have a relatively high-powered offense led by point guard Stephen Curry and impressive second-year sharp shooter Klay Thompson. While I have already discussed that potential all-star Stephen Curry may be the key to a playoff appearance for Golden State, Andrew Bogut may be the man who has to reach up and turn the key in the lock. The Warriors cannot survive as a run-and-gun team with no size and he is the solution to that problem. They simply do not have the elite guards to make such a system work as they proved when they had the talented Monta Ellis. That’s not to say their guards are not good—it’s just that they aren’t Chris Paul or Dwyane Wade (both even actually have support in the interior with Blake Griffin and Chris Bosh, respectively). What type of numbers should the Warriors expect from the $13 million pick-up? 13 points and 10 rebounds per game to complement a couple nightly blocks is definitely within reason if he can bounce back from his injury. Whether that is enough to help the Warriors reach the playoffs remains to be seen.